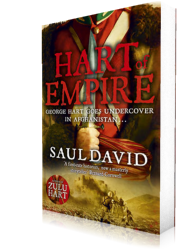 The second instalment in the George Hart series, set during the 2nd Anglo-Afghan War of 1878-80. George Hart is asked by Prime Miinister Disraeli to undertake a secret mission to Afghanistan. Hart's mixed race makes it easy for him to go undercover, and with his past catching up on him in England, he accepts the job. Hart must journey through a strange and violent land, to steal the iconic Prophet's Cloak, a potent symbol of rebellion for religious extremists. But, on the run with a dangerously alluring Afghan princess, Hart finds himself questioning his mission. Loyalty to his conscience or his country - Hart must decide.